Notice how the two large light boxes separate her from the background? Very important to avoid a face floating in black. I also chose this pose because for me it was all about her arms and I wanted them prevalent. Next I did a color and b&w combo image in Photoshop where I leave her arms in color but the rest in warm tone black and white. Here is the screen capture of the process. 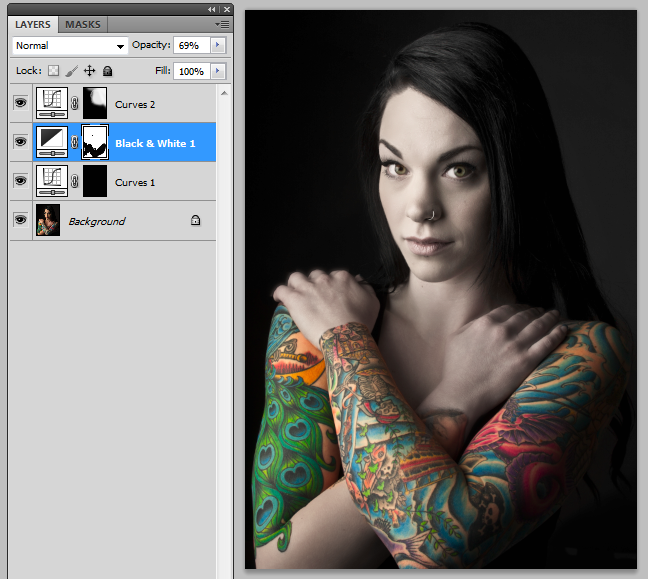 The first curves layer is to add contrast, which every RAW capture needs. Above that is the black and white conversion layer. This layer converts the image to B&W. Notice the mask next to it? This is where you paint black on the mask to bring back just the color on her arms. Also notice that that B&W layer is set to 69% opacity which allows a hint (31%) of her skin color to come through which makes her skin muted in color. This is just a different version of another image where the skin is totally b&w and lighter the the previous image. When it comes to digital photography and Photoshop, only your imagination is the limit.